I must have been about eight or nine years old when Jurassic Park was released across cinemas but I never saw it until it was released on VHS. I’m sure we all went through that dinosaur phase when we were younger and were obsessed with dinosaurs. I definitely remember having various action figures, toys and other merchandise thanks to Jurassic Park. It was a momentous movie for everyone, even more so for a child. Jurassic Park was based on Michael Crichton’s book of the same name. Universal bought the rights so Steven Spielberg (well-known for E.T., Jaws and Schindler’s List) could direct it. David Koepp (The Lost World, Mission Impossible) wrote the screenplay. Spielberg shot the film in Hawaii among other places which accounts for its wonderful scenery. The film starts off and introduces us to the main characters. Alan Grant (Sam Neill) is a palaeontologist working on a dig site with his student and love interest Ellie (Laura Dern) who specializes in prehistoric plants. We learn that an eccentric billionaire called John Hammond (Richard Attenborough) wants to bring them to his “Jurassic Park” to show them what he has done. 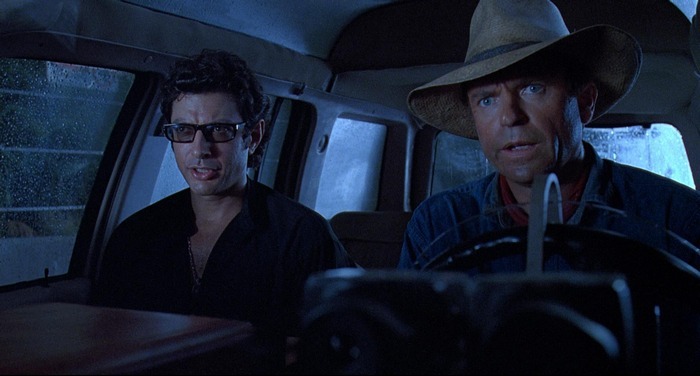 Supporting characters include Gennaro, a lawyer and Ian Malcolm (Jeff Goldblum) who is a mathematician. We then have Hammond’s two children, Lex (Ariana Richards) and Tim (Joseph Mazzello). Dr. Grant sort of finds the children annoying at first but by the end of the movie, the dynamic changes and he really appreciates them. The cast is really wonderful and I don’t have a bad word to say about them. The likes of Sam Neill, Jeff Goldblum and Richard Attenborough were quite well-known people prior to Jurassic Park. The film doesn’t get too involved in the characters’ backgrounds, especially when compared to the novel, and it’s the dinosaurs that take the centre stage here. When we get to Jurassic Park, John Hammond shows the group the dinosaurs he has created. Seeing the scale and realism of that Brachiosaurus standing up on its back legs is such a momentous moment. At the time, the visual effects work from ILM is nothing short of astonishing. 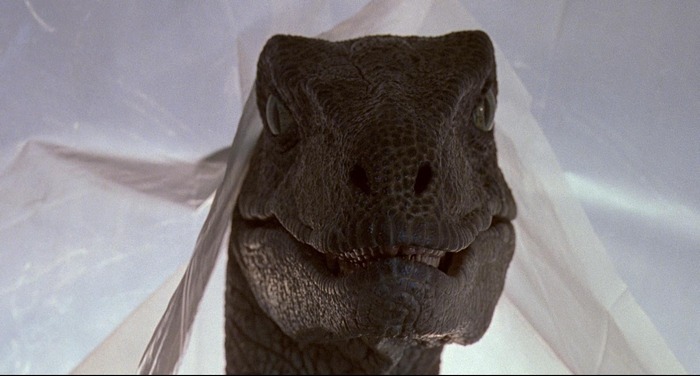 Jurassic Park is one of those films in the early 90’s that just pushes the envelope for visual effects. The effects still hold up well today. Generally, the full-body shots of the dinosaurs moving are all computer-generated while the close-up shots are animatronics, created by the legendary Stan Winston and his team. Stan Winston is, of course, well known for his special effects work on Aliens, Predator and both Terminators. They try to blend the CGI and animatronics together seamlessly but it’s all too obvious which is which when you view the scenes. Animatronics just look much more realistic than CGI. This is why every movie or TV Show that feature dinosaurs (like the recent Terra Nova) never seems to match Jurassic Park in the effects department. They rely on cheap CGI for everything instead of creating actual animatronics. I guess we should talk about the Tyrannosaurus Rex scene. 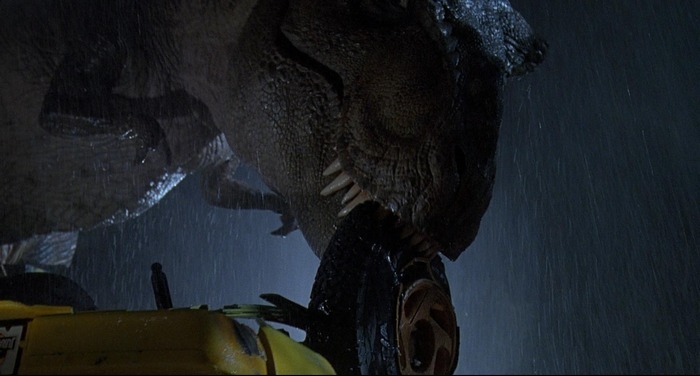 It’s the most iconic scene in Jurassic Park and probably one of the most memorable scenes ever created. Everything in it just works perfectly. The atmosphere, the suspense, setting the scene on a rainy night. It all adds to it. Spielberg sets the scene in motion a little earlier when the Tyrannosaur failed to appear when it was given a goat. Then when the group is stranded outside the paddock on a stormy night, we hear loud thumping noises causing the ripples in the cup of water in the vehicle. It’s little things like this that creates so much tension. Lex asks where the goat is, and its leg suddenly lands on the roof. We get some great terrified reactions from Gennaro, Lex and Tim. The creature itself is just so realistic looking and moves and behaves just how you would expect it to. Again, Stan Winston has created another iconic character with the T-Rex. It looks so terrifying. The other antagonists of Jurassic Park are the Velociraptors. Spielberg is careful not show the creatures too early and we only get subtle hints of their presence. We get the first proper look at them when Ellie and Muldoon try to restore the park’s power. We don’t see the Velociraptors fully until Dr. Grant, Lex and Tim make it to the visitor’s center. The children hide in the kitchen while two Velociraptors stalk them. It’s another wonderful scene full of suspense. Like the Tyrannosaurus, Stan Winston has done another amazing job in bringing the creatures life. The close ups are animatronics while the full body movement shots are CGI. Even though the Velociraptors in the movie are completely different to their real-life counterparts (smaller and feathered), whenever anyone thinks of a Raptor, it’s the creatures here that people think of. I have read Michael Crichton’s Jurassic Park novel… well, I listened to the audiobook at least and there is an awful lot of scenes in there that weren’t in the movie. More characterisation, more exploration with Dr. Grant and the children, the Tyrannosaurus along the river. Like every movie based on a novel, cuts are to be expected though. Turning a huge novel like Jurassic Park into a movie was always going to be a difficult task. All is not lost though as a lot of the action scenes in the novel made it into The Lost World and Jurassic Park 3. The score was composed by John Williams who is well-known for his work on the Harry Potter and Stars Wars films. The score is amazing and it really gives the audience a real sense of awe and amazement when we are first introduced to the Brachiosaurus. It still gives me goosebumps watching that moment. I think pretty much everybody has seen Jurassic Park and knows what a huge blockbuster it was. Steven Spielberg sort of brought dinosaurs back into the mainstream and generated a huge amount of interest in them and in palaeontology in general. I’m glad I saw it when I was a child. It’s still a fine movie 20 years later but it’s just much more spectacular when you see it as a child.